Mrs. P from Mrs. P’s Magic Library! 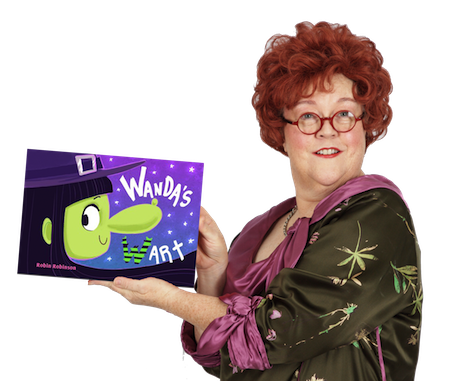 Wanda’s Wart is an all-ages indie picture book about the importance of friendship, honesty—and not being afraid to stand out for what makes you an individual. This story may be a tool for dealing with certain kinds of bullying, and for kids who run the risk of suppressing their interests and talents just to fit in. I love the message that we could all be a little more fearless about being ourselves, warts and all. You can enjoy a reading of this story at my free website too. Thank you so much, Mrs. P, for sharing your favorite book and helping us to #BookItForward! If you’d like to see and hear much more from Mrs. P, be sure to visit her Magic Library where you can hear stories, play games, and do lots of fun activities! #BookItForward encourages people to share a book they love with a person they love. It can be a new book, a used book, or a recommendation for a library book! GIVE it or recommend it to someone who would enjoy it. POST a photo of the book tagged with #BookItForward on Instagram, Twitter, or Facebook. TAG three people in the post to nominate them to #BookItForward next!